I met members with experience with the Scarsdale diet – people who have successfully lost weight in the past. Other group members are new – enthusiasts who are determined to start right away their weight loss journey. I heartily welcome you all and admire your strong will and desire to change! Follow it strictly. No exceptions or substitutions on your own. 1. Q: Is there any meal portioning? A: No, there isn’t any portioning. You can eat as much as you like. 2. Q: What about snack in between meals? Can I have any? A: Yes, you can. Between meals you can snack on celery stalks and carrots. 3. Q: Can I substitute the lamb for another meat? A: Yes, you can. Lamb can be substituted with lean beef, chicken, turkey, fish, shellfish, or veggie protein. 4. Q: What does “assorted cold cuts” mean? A: You can choose cold meats like chicken, turkey or cold fish – those are the most common meat choices. Cold beef, lamb, veal, lean ham are also possible choices, but of course with all visible fat removed. Avoid processed meats like salami. 5. What about seasonings, herbs, dressings, sauces or fats. Are any of these allowed? A: Seasonings and herbs are allowed – salt, black pepper, parsley, dill, pennyroyal, etc. all in moderate quantities. Soy sauce, ketchup and mustard are high in calories, so you can use them, but in very small quantities. Use only lemon and vinegar. No mayonnaise, butter, oil, margarine or other rich dressings are allowed! 6. Q: Are there any vegetables that are not allowed on the Scarsdale diet? A: Yes, there are some vegetables you should avoid – corn, avocado, peas, potatoes, sweet potatoes/yams, lentils and any beans except green. 7. Q: What is a protein bread and where can I find it? A: Protein bread is very delicious with nutty flavor*. Tastes fantastic when toasted. I recommend you to munch it very well on small bites to fully enjoy its taste. Don’t forget to check the ingredients and always avoid buying bread containing sugar, honey, or other sweeteners. 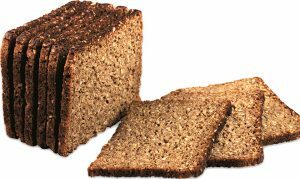 If can’t find protein bread, you may substitute it for a whole wheat bread or gluten bread. NEVER substitute with white bread! Keep the protein bread in the fridge or freezer. * Check out article’s image – that’s a protein bread. 8. Q: I dislike spinach. Can you give me a suggestion on a substitute for it? A: Any leafy green would work great as a substitute – arugula, Romaine lettuce, watercress, kale. 9. Q: How about working out while following the Scarsdale diet? A: It’s great. Follow your everyday working out routine. If you don’t have usual physical routine, Dr. Tarnower recommends:”If at all possible, that you walk briskly at least two miles a day. If you enjoy swimming, golf, tennis, and other sports, go to it.” Any moderate exercise is good.